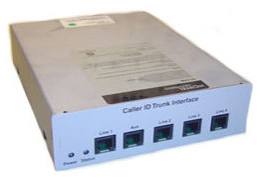 The Nortel BCM-CTM 4 Media Bay Module connects up to four analog CLID PSTN lines to the BCM system. One auxiliary ports permit the connection of a 33.6+ Kbps modem, fax machine or single line analog telephone to line 1. When the auxiliary device is using line 1, the BCM system does not allow other telephones to use line 1. When a single line analog telephone is connected to the auxiliary port, it can be used as an emergency telephone. The BCM-CTM 4 connects up to four analog CLID PSTN lines to the BCM system. One auxiliary ports permit the connection of a 33.6+ Kbps modem, fax machine or single line analog telephone to line 1. When the auxiliary device is using line 1, the BCM system does not allow other telephones to use line 1. When a single line analog telephone is connected to the auxiliary port, it can be used as an emergency telephone.